Treasury Secretary Steven Mnuchin told lawmakers in a classified briefing Thursday that the Trump administration will keep strict U.S. sanctions on Oleg Deripaska and any companies he owns, but Democrats say they still have concerns that the government is being too soft on the Russian oligarch. In one of Democrats' first oversight moves as the new majority in the House, seven committee chairmen wrote to Mnuchin on Tuesday and asked him to explain by the end of the week why the U.S. decided to ease sanctions on three companies linked to Deripaska. 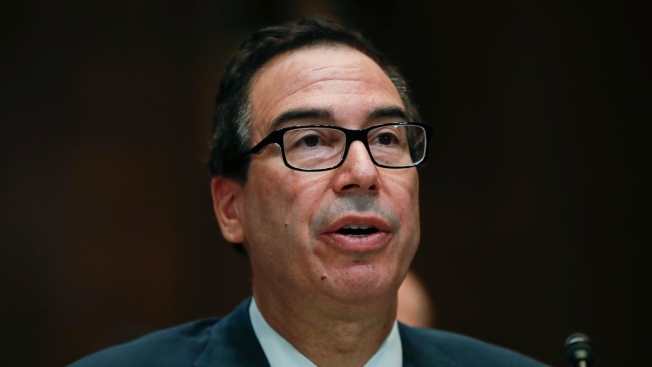 Mnuchin promptly came to Capitol Hill to answer questions about the matter, but Democrats leaving the meeting said his answers weren't sufficient. House Speaker Nancy Pelosi said she was "unimpressed" with Mnuchin's briefing, saying that he was not fully forthcoming in the classified setting and was "wasting the time of the members of Congress." Asked if the House may move to block Treasury's actions, Pelosi said "we'll see." The Democrats were asking Mnuchin about a December announcement that the U.S. would lift sanctions on the three companies — the aluminum manufacturing giant Rusal, EN+ Group and the Russian power company JSC EuroSibEnergo. EN+ Group is a holding company that owns nearly 50 percent of Rusal. In the letter, the Democrats said the sanctions deal appears to allow Deripaska to keep "significant ownership" of one of the companies. Congress has 30 days to block the move to terminate the sanctions, but Democrats have asked for an extension. Treasury announced the move just before the December recess and before the start of the government shutdown, the Democrats said, and they haven't had enough time to review it. The Treasury Department maintains that Deripaska will remain blacklisted as part of sanctions that targeted tycoons close to the Kremlin, and that the companies have committed to diminish Deripaska's ownership and sever his control. In a statement released ahead of the briefing, Mnuchin reiterated that Deripaska remains under sanctions, "his property and interests remain blocked, and any companies he controls are also sanctioned." The three companies were originally targeted because they were owned or majority-controlled by Deripaska. "These entities are undergoing significant restructuring and governance changes that sever Deripaska's control and significantly diminish his ownership," Mnuchin said in the statement. "They have committed to provide Treasury with an unprecedented level of transparency into their dealings to ensure that Deripaska does not reassert control. As a result, these entities will no longer be designated for sanctions." He said if the companies fail to comply with the terms, they could face the re-imposition of sanctions. Mnuchin also spoke briefly after the hearing to refute Pelosi's assertion that he was not forthcoming, saying he "answered all their questions." House Intelligence Committee Chairman Adam Schiff, D-Calif., said he pressured Mnuchin on concerns he has that Deripaska and other Kremlin allies will continue to exercise influence over the companies. "It will be incumbent upon Congress to maintain pressure on the Treasury to explain its reversal of course and why Deripaska or his companies are suddenly deserving of this relief," Schiff said. Texas Rep. Lloyd Doggett, a Democratic member of the Ways and Means Committee, said he was also unsatisfied with Mnuchin's answers but saw his attendance as the start of a new era of Democratic oversight of President Donald Trump's administration. "We are saying to the Trump administration, and to the Russians, we are looking carefully at every transaction you are involved with," Doggett said. "We will exercise our oversight."